You mean they're not just pine trees? 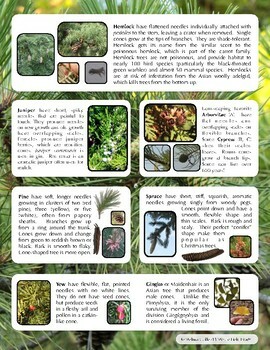 This two page guide is great for the field or the home/classroom to identify pine, fir, spruce, hemlock, juniper, cedar, larch, and more! 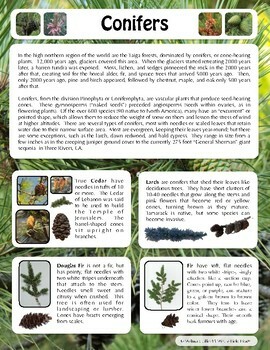 Laminate it and take it outdoors to identify conifer trees in the neighborhood. 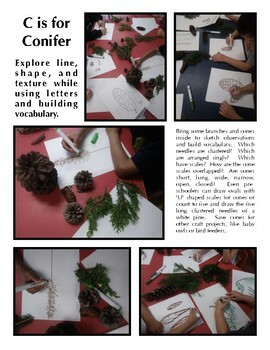 Bring some branches and cones inside to sketch observations and build vocabulary. Which needles are clustered? Which are arranged singly? Which have scales? How are the cone scales overlapped? Are cones short, long, wide, narrow, open, closed? Even pre-schoolers can draw ovals with "U" shaped scales for cones or count to five and draw the five long clustered needles of a white pine. Sing TMBG's "C is for Conifers" to add to the fun! Save cones for bird feeders or baby owl ornaments.